2,500 is a BIG NUMBER!!! I try not to focus on post & word counts too much, but having that widget right there in the sidebar, sometimes I can’t help it – it’s kinda crazy to think that just 8 months ago I was shocked about breaking 500,000 words, and yet now here we are 100,000 words later and still in 2012 and everything! And even worse, realistically that 100,000 is probably about a third of what I expect to have for 2012 as a whole at the end of the year when you look across all of my various writing projects combined! 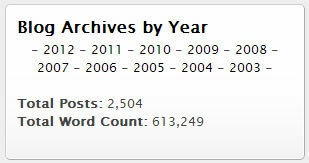 So will I break 700,000 words by the end of the year around this blogging neck of the woods?? ?